New York: Oxford University Press, 2013. Hardback, pp. 480. ISBN 9780199357406. Price approx. £38.00, €47.00, $53.00. I’ll look at the music. It’s better. This statement stands at the opposite extreme from a striking anecdote concerning Wanda Landowska which Nicholas Cook invokes in his expansive study Beyond the Score: Music as Performance: ‘she imagined Rameau rising from his grave to demand changes in her performance of his La dauphine: “You gave birth to it”, she imagined herself saying, “it is beautiful. But now leave me alone with it. You have nothing more to say; go away!”.’Nicholas Cook, Beyond the Score: Music as Performance (Oxford: Oxford University Press, 2013), 95. This powerful declaration of Landowska’s independence might satisfy the expectations of the most ardent advocates of the idea of music as performance. Fou Ts’Ong’s entirely opposite (and, in this context, perhaps surprising) faith in his ‘slavish’ mission would be more at home amongst those theories – burdened by what Cook calls Plato’s curse – declaring that music exists as notation. The two quotes from these brilliant musicians are not juxtaposed here in order to invalidate one by means of the other. It is just that, having to hand the impressive collection of views on music as performance assembled by Cook (dominated – understandably so, given the subject of the book – by convictions of the contributive, or even creative, role of the performer), one cannot resist the temptation to note these contrasting perspectives. 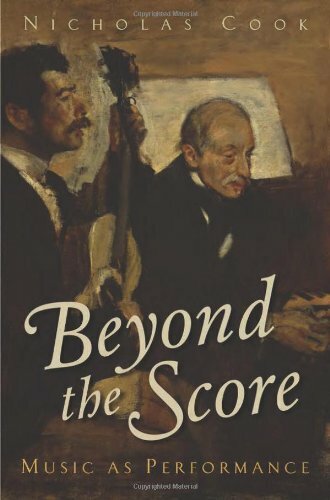 The anecdotal information detailed here does not do justice to Cook’s Beyond the Score, let alone measure up to his essential subject – one of the greatest conundrums in the age-old discussion of music – namely, what music is. that you can start to make sense of scores.Ibid., 1. The task as thus defined is essentially realised, and its execution (prompted by the belief that ‘the study of music has from the beginning been skewed, and its relevance to most people outside academia diminished, by its orientation towards music as writing’) involves gathering and presenting ‘a wide range of concrete proposals for how we might study music as performance and what we might learn from it’.Ibid., 2. Confronted by a veritable cornucopia of views on the subject of performance (which the author cites with consummate erudition: at times juxtaposing them, in such a way that we might draw conclusions from them; at other times synthesising them, in order to reveal his own opinion on a particular matter), we revel in discovering their cohesion or contradiction, motivated – in both of these respects – to discussion. The wealth of issues dealt with in this book makes it impossible to discuss them here in a comprehensive and objective manner. Forced to choose between providing superficial summaries of particular chapters and extracting two or three absorbing details (motivated by personal interest alone), I will opt for the latter. My attention is riveted, for example, by Cook’s readings and de-stereotyping of studies by Schenker and Hanslick; by the comparative analyses of countless performances; and by the deft, insightful conclusions drawn from a wide range of theories convincingly grouped together. The strongly accentuated division between analyses of live and recorded musical creations is especially striking (in everyday practice, these are sometimes casually treated as comparable, if not equivalent). Another inspiring feature is the distinction between theoretical and performance analysis. That differentiation – pointed out by John Rink and subsequently described by Cook – is of crucial significance to our understanding of the problematic variance between the observations of theorists on the one hand and the individual interpretations of practising musicians on the other. Cook, drawing into consideration the theory of Mark Johnson and Steve Larson, elaborates on the opposition between the two kinds of analysis by referring to the dimensions of time (the performer, unlike the theorist, has to analyse a work in real time) and space. Spatial relations can be reduced, in a nutshell, to the distinction between the perspective of the observer (the theorist), who has the privilege of beholding a composition from a distance, from a bird’s eye view, and that of the participant (not only the listener, but also the performer), who finds him- or herself proceeding from one note to the next in the midst of a work. One virtue of Cook’s study in general is its exceptional clarity, and even if some comparisons might seem strained (such as that of musicology and the study of literature as a text, or the study of performance and the study of drama as a performance art – as opposed to such a perception of literature as a whole), one undoubtedly gains greater understanding of the history, origins and modes of existence of the fascinating phenomenon that is musical performance. provenance altogether and treat it as a force or a quality of nature itself.Michał Bristiger, ‘Wstęp’ [Introduction], in Carl Dahlhaus and Hans Heinrich Eggebrecht, Co to jest muzyka? [What is music? ], tr. Dorota Lachowska (Warsaw: Państwowy Instytut Wydawniczy, 1992), 7. Equally, being wedded to the ideas of certain great musical thinkers and writers, they might insist on seeking the essence of what music is not just beyond the score, but equally beyond the performance (and especially beyond the performer). Yet even the most sceptical readers could not deny that their reflections, and especially their recourse to other texts devoted to musical performances or, on the contrary, to the most esoteric philosophies of music, were motivated and inflected by Nicholas Cook’s expertly crafted study. So it is worth experiencing this book in a full and personal way.